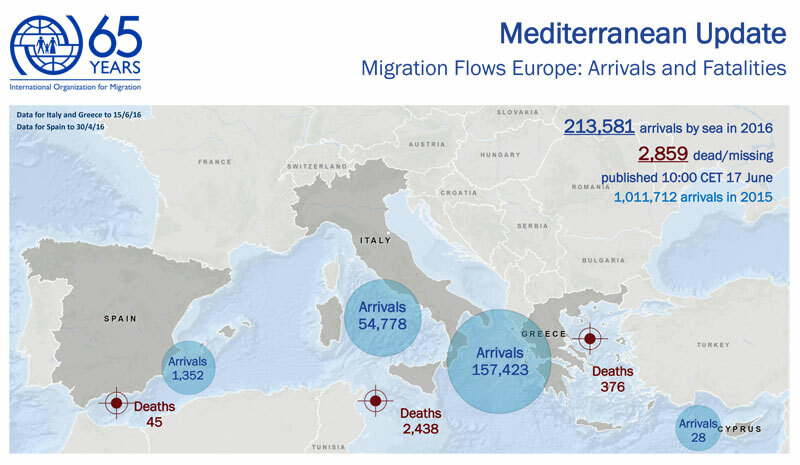 Italy - IOM reports an estimated 213,581 migrants and refugees entered Europe by sea in 2016 through 15 June, arriving in Italy, Greece, Cyprus and Spain. Deaths so far this year are 2,859 compared with 1,838 through the first six months of 2015. In other words, fatalities on the Mediterranean Sea in 2016 stand at 1,020 ahead of last year’s mid-year total, although we remain three weeks shy of 2016’s mid-year point. IOM’s spokesman in Rome Flavio Di Giacomo reported Thursday over 2,800 migrants had been rescued at sea and brought to port since the last report. Further, another 414 migrants were rescued but were not yet on land, so that over 3,200 migrants will have arrived in Italy since Monday. IOM estimates 54,778 migrants have arrived in Italy so far this year, which is about 5,000 fewer than the total of arrivals to Italy last year through June 15. By the end of June last year, arrivals were 70,354.